Slightly bonkers chopsocky with a strange supernatural twist and some great fight choreography. Dorian Tan’s mother is kidnapped by marauding despot Lung Fei, but his kung fu is not up to scratch to launch a solo rescue. Luckily he’s the son of General Stone – proud defender of a deceased Tang dynasty ruler, who continues to stand guard in statue form outside the king’s shrine. Tan falls down a well and ends up in a underground house of traps where the general comes to life and his statue mates teach him how to fight. Meanwhile, fellow Tang patriot Polly Shang launches her own revolt with her revolutionary buddies. Shang is particularly awesome in this, running riot in her favourite setting as a no-nonsense wuxia sword-slinger. 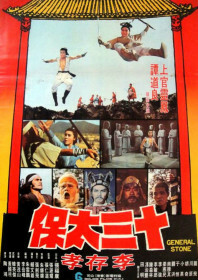 The leads have to contend with a duo of whip-cracking crazies (masters of the so-called ‘vagabond arts’), a bodyguard with a spiky ball and chain, and Lung Fei’s giant bow. There’s a lot to enjoy.